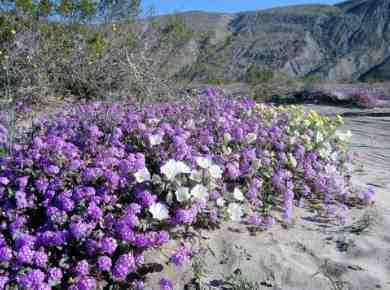 Enjoy the beautiful spring wildflowers and hiking in Anza Borrego State Park, a desert in Southern California. Anza Borrego is the largest state park in California, located east of San Diego in Southern California. It is famous for its springtime wildflowers, wilderness areas, dirt roads and hiking trails for a California Desert adventure. While the temperatures in the summer can be too hot for most people, the rest of the year it can be an interesting day excursion from San Diego and other southern California areas. If you want to get away from it all, and explore the beauty of the desert, this is a great destination. If you want a weekend away with night life, Palm Springs would be another popular southern California destination to consider. Anza Borrego Desert State Park is the perfect weekend getaway location in southern California. This desert wonderland is not as well known as some of the national parks, so it tends to be less crowded. It is located approximately 90 minutes east of San Diego, 3 hours from Los Angeles and 90 minutes from Palm Springs. Be sure to stop in and see the Anza Borrego Visitors Center, an underground 7000 square foot center with interesting exhibits relating the the park history, native Americans, and desert life. It is located just outside the town of Borrego Springs. We enjoy visiting Anza Borrego in the spring to see the wildflowers, and in winter to relax in a spa during the warmth of the desert winter. 2010 Wildflowers in Anza Borrego. Each season varies. Every year we try to visit Anza Borrego for nature's wildflower show. 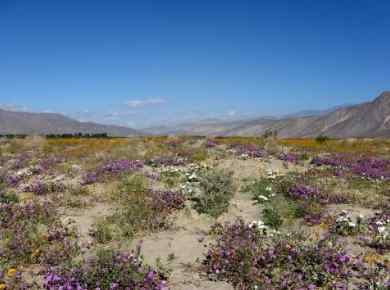 Depending on the winter rains and weather, you will see a different display of Southern California wildflowers in Anza Borrego. Typically peak bloom is during March in the valley and April in the canyons, with some flowers still blooming in May, especially at the higher elevations in the park. Regardless, you will see different species bloom at different times, so come out and enjoy. The hiking is also nice until the hot summer weather hits, so don't wait to come see this lovely park. 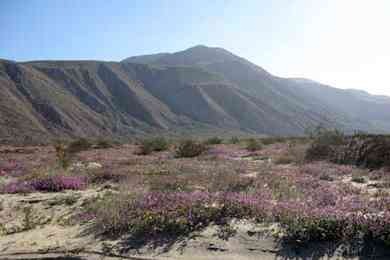 For some recent photos of Anza Borrego Wildflowers, see www.abdnha.org. Will you see spectacular blooms this year? Each season will depend on the winter rains. For maps and additional information, see the official Anza Borrego Desert State Park website www.parks.ca.gov. They have a flower update and map if you scroll to the bottom of their page or call the wildflower Hotline at 760-767-4684. 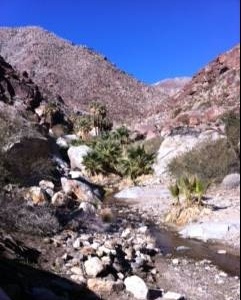 Hike the Palm Canyon Trail - This is one of the most popular activities in the park. The Palm Canyon Trail is 1.5 mile trail to see a Palm Oasis in the desert. The trail is appropriate for all ages and is well marked, but the route has many rocks and boulders so no strollers or wheel chairs. Bring plenty of water and plan to relax in the shady palms at the oasis before your return hike. If you are lucky you will see some peninsular bighorn sheep that roam the desert canyons in Anza Borrego. The trailhead is located in the Borrego Palm Canyon Campround just outside the town of Borrego Springs. Anza Borrego Visitors Center - This interesting visitor center is built an underground with exhibits relating the the park history, native Americans, and desert life. It is located just outside the town of Borrego Springs. Borrego Springs - This town in located at the bottom of the mountain as you enter the park. The town is centered around Palm Canyon Drive, but take some time to drive around the town and you will see golf courses, interesting artwork, and desert life. Spring Wildflowers - Anza Borrego is known for its desert spring wildflowers. Each year is different - some showy and spectacular along the roadside, and other years more subtle along the trails and back country. You can call the Anza Borrego Desert State Park wildflower hotline in March and April to find out the best places to see the wildflowers at 760-767-4684. Galleta Meadows - See the large desert safari metal sculptures that are bigger than life. My favorite is the mythological dragon. Other sculptures include camels, sloths, llamas, mammoths, wild pigs, raptors, tortoises, saber-tooth cats, giant birds, and one of the explorer Juan Bautista de Anza. The sculptures are located just off of Borrego Springs Road and were created by artist Ricardo Breceda on the estate of Ricardo Breceda. Free public access. Bike Tours Anza Borrego - Explore the desert park by bicycle. Bring your own or rent bikes at Bike Borrego located at The Mall in Borrego Springs. Phone 760-767-4255 for reservations and current prices. Anza Borrego State Park is the largest state park in California, located east of San Diego in Southern California. It is a popular outdoor travel destination from October through April. During the hot summer months of May through September, the high temperatures discourage all but the die hards from desert life. Visitor Center Operating Hours: Open daily from 9 AM - 5 PM in the spring, weekends during summer. May be closed some days due to California budget cuts, so call to confirm the visitor center will be open. Things to Do: Hike one of the many trails, camp in the desert, bike ride, explore the visitor center, ride off road vehicles, see the spring wildflowers, enjoy a spa. Directions to Anza Borrego State Park, Cal. : From San Diego area on Interstate 15, go east on highway 78, left on highway 79, right on San Felipe Rd, left on Montezuma Valley Road. After you descend over the mountains into Anza Borego, go left on Palm Canyon Road. Parking: Free at visitors center. $8.00 day use fee for Palm Canyon hiking trail per car during season. Ticket Prices: free admission to the Visitors Center. Food: Some restaurants in nearby Borrego Springs, or bring a picnic lunch. Try a sandwich from Calico's at The Mall on Palm Canyon Drive (760.767.7747) or Carmelita's for some Mexican food just across the street (760.767-5666). Kendall's Cafe offers some traditional breakfast, burgers and salads and is located at The Mall behind Calico's (760.767.3491). For dinner, try Arches at Borrego Springs Resort (760-767-5700) or the Big Horn Restaurant at the Palm Canyon Resort (760.767.5341). Places to Stay: There are some campgrounds in Anza Borrego State Park, or you can stay nearby in Borrego Springs. For our recommendations, see Anza Borrego Hotels and Places to Stay. Borrego Palm Canyon Campground: The state of California offer a campground located in the heart of Anza Borrego Desert State Park. Camping is available all year, but reservations are available and recommended from October 1 - April 30. Campground includes tent camping and RV camping, with some sites with hook-ups. Dogs are allowed in campground but not on trails. The popular Palm Canyon Trail has the trailhead from this campground. Call for reservations 800-444-7275. Palm Canyon Inn and RV Resort: This family oriented resort has everything you need - pool, hot tub, restaurant in an old town atmosphere, and is located in Borrego Springs within walking distance of the state park visitors center . Choose to stay in the hotel or reserve a spot for your RV. Call for reservations Phone No. 800-242-0044. Address Palm Canyon Drive. Borrego Valley Inn: This small upscale inn is our favorite destination for couples. The rooms are decorated in a rustic style, and you can relax in the pool or spa. Tasty breakfast and afternoon cookies are included. Call for reservations. Phone No. 800-333-5810. Address 405 Palm Canyon Drive, Borrego Springs, California 92004. Borrego Springs Resort: This luxury resort has great views of the valley, a full golf course, tennis courts, pool and spa. Enjoy the championship golf course or pamper yourself with a massage, facial or other spa treatment. 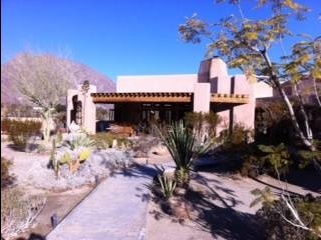 Located 2 miles from the heart of Borrego Springs at the near the Santa Rosa mountains. Phone No. 888-826-7734. Address 1112 Tilting T Drive, Borrego Springs, CA 92004. Santa Rosa Plateau Ecological Reserve - visitor center is off Clinton Keith Road, west of Interstate 15. For more informaiton call 951-677-6951. Black Mountain Park - off Carmel Valley Road in Rancho Penasquitos. Harford Springs Park - in the Gavilan Hills, east of Interstate 15 along Gavilan Road. Mission Trails Regional Park - in San Diego off Mission Gorge Road. Antelope Valley California Poppy State Natural Reserve - west of Lancaster. Head north on Interstate 5, east on Highway 138, right on 170th Street,left on Lancaster Road, and continue another ~2 miles. See more Hiking Trails in San Diego.